Schatt & Morgan Heritage Series Rosewood Jack No. 1215 : 2011, 3 ¾” closed, rosewood handled jack from the Heritage Series No. 1, 1095 carbon ste..
Schatt & Morgan File & Wire, 041812, Medial Toothpick, worm groove bone: 2007, 4 1/4” closed, ATS – 34 stainless steel blade, NS bolsters and bras..
Schatt & Morgan File & Wire, 043213, Wildcat Driller Whittler, worm groove bone: 2007, 4 1/2” closed, ATS – 34 stainless steel blade, NS bolsters ..
Queen Cutlery – JOE PARDUE Hawksbill Pruner: 4’ closed, stag handles, NS bolsters and liners and D2 blade, mint with box. .. 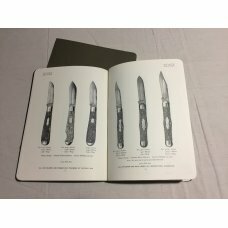 Knife Collector’s Encyclopedia by Jim Parker – 2004, signed by Buz Parker. 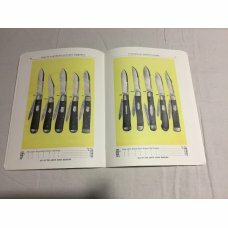 Knife Collector’s Encyclopedia by Jim Parker – 2004, signed by Buz Parker. 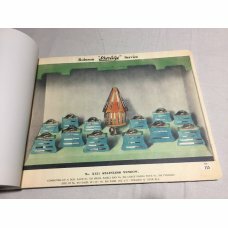 400 pages, mint condition. ..
Schatt & Morgan Stag Scout Utility #0432SK, 2013: 3 5/8” closed, Stag handles SS pinned, 420 SS blades, brass handles, NS bolsters and shield, and ..
Queen Cutlery Company No. 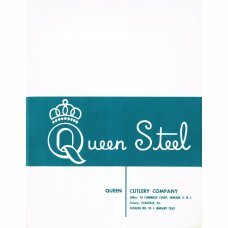 95 – January 1963: 49 pages, no marks or tears, near mint. ..
Queen Cutlery Co. #38 Jumbo Folding Hunter in Winterbottom Bone: 5 1/4” closed; late 1940s, no etched blade, Big “Q” tang stamp, genuine Winterbott..
Queen Cutlery #38 folding hunter: 5 ¼” closed, genuine Winterbottom bone handles, no cracks or chips, carbon steel blade that appears to have been ..
Queen Cutlery Co. #28 English Jack in Winterbottom Bone: 4 1/2” closed; circa 1961, etched blade, no tang stamp, genuine Winterbottom bone handles ..
Queen Cutlery Master Cutlery Collection - Peanut: 1981, 2 3/4” closed, Limited edition of a two blade peanut jack pattern #14, brown jigged bone h..
Queen Cutlery Carved Stag Bone Doctor Pattern #96: 2006, 3 5/8” closed, Carved Stag Bone handles, polisher stainless steel blades, NS bolsters,..
Schatt & Morgan Jigged Caramel Bone Medium Congress: 2001, 3 ½” closed, jigged caramel bone handles, brass liners, NS bolsters, 1 of 150, mint with..
Reproduced Schatt & Morgan Cutlery Company’s first catalog: accurately copied from an original 1903 catalog and printed in 2010; 54 pages, 7 ¾” x 1..
Reproduced Schatt & Morgan Cutlery Company’s second catalog: accurately copied from an original 1907catalog and printed in 2010; 130 pages, 9” x 12..
Queen Cutlery #53 Melon Tester - Fruit Knife: 4 ¾” closed, 1960s, melon tester or sausage knife, single etched stainless spear blade with imitatio.. 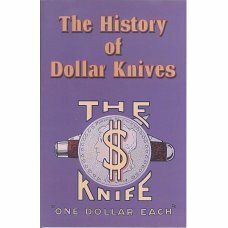 In the early 1920s, The Dollar Knife Corporation was being operated under lease as a sales organization of the Schatt & Morgan Cutlery Co. of Titus..
Schatt & Morgan, F&W, Heavy Jack 042190: 2012, ATS34 blades, 4 1/8" closed, bone handles, NS bolsters and brass liners; mint with a box. 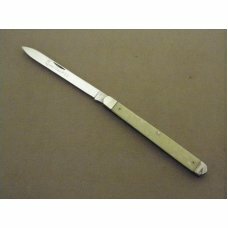 ..
Winchester W 15 2978 Pearl Doctor’s Knife: 1991, 3 3/16”closed, presentation pearl two blade physician’s knife, carbon steel blades, half stops, NS..
Winchester W 15 1901 Pearl Fishtail Jack: 1991, 3 7/8”closed, presentation pearl handled one blade jack, carbon steel blades, NS bolsters and brass ..
Winchester W 15 3904 Pearl Whittler: 3 1/2” closed, 1991, three back spring whittler, pearl handles, NS bolsters and shield, brass liners, half s.. Kissing Crane NKCA &DA club knife 1977: Large three blade canoe pattern by Kissing Crane, 4 1/4” closed, 1977 NKCA club knife, stag handles in be.. 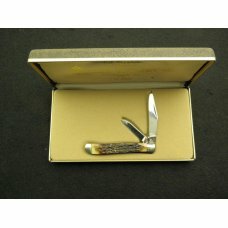 Kissing Crane NKCA &DA whittler 1975: Anglo Saxon whittler by Kissing Crane, 4 5/8” closed, 1975 – first NKCA club knife, only 1200 produced; stag.. 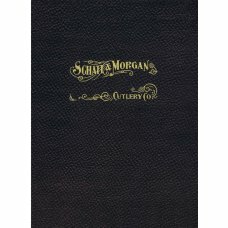 There are only two known catalogs published by the Schatt & Morgan Cutlery Company during the company’s existence from its 1897 start in Gowanda, New ..
Schatt & Morgan, Keystone Series II, Doctor’s Knife, #042298: 1992, 3 1/2” closed, ATS34 blade, NS bolsters and brass liners; mint with a box. 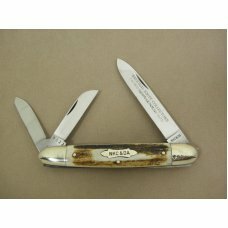 ..
Schatt & Morgan, Keystone Series II, Slim Trapper, #041811: 1992, 4 1/8” closed, ATS34 blade, NS bolsters and brass liners; mint with a box. 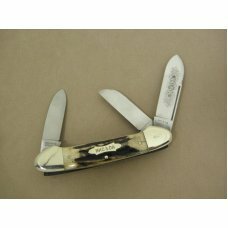 ..
Schatt & Morgan, Keystone Series II, Swing Guard Folding Hunter, #04181L: 1992, 4 1/2” closed, ATS34 blades, NS bolsters and brass liners; mint with..